International classification society and certification group Bureau Veritas has published a set of guidelines, NI 603, intended to help the development of current and tidal turbines. The guidelines are backed by a separate guide to certification for marine renewable energy devices including tidal turbines, wave energy converters and ocean thermal energy conversion. Philippe Donche-Gay, Executive Vice-President and Head of the Marine & Offshore Division of Bureau Veritas says, "Marine renewable energy offers promising sources of clean energy. Emerging technologies that generate electricity by harnessing the power of tidal streams, waves and temperature gradients, are moving from research phase to commercial use. 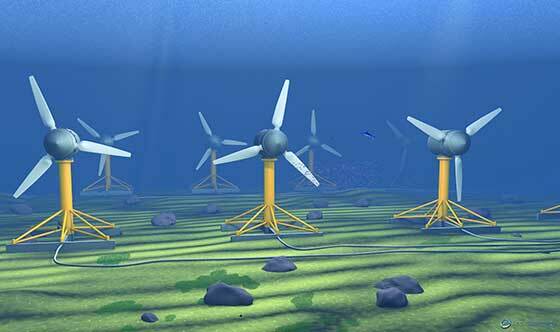 We think that over the next five to ten years, the number of tidal turbines in particular is set to multiply. There is a clear need for standards and certification in this fast-developing field." To ensure the commercial viability of their projects, designers and operators involved in marine energy must be able to demonstrate their technologies are safe and offer high quality and reliability. This can be complex in an emerging sector with no real track record, and where international standards are still under development. Bureau Veritas, as an established certification body with extensive experience in renewable energy and marine and offshore energy issues leads the industry with these guidance notes setting standards specific to current and tidal turbines and guidelines on certification for them. NI 603 Current and Tidal Turbines sets down guidelines applicable to current and tidal turbines which are installed on the seabed and which produce electricity from tidal power, underwater current power or estuary water power. They cover the materials and loads for the support structure, including foundations and turbine and also the requirements for the electrical installation. There are sections on life-cycle considerations, manufacturing, installation, commissioning, maintenance and decommissioning. The Marine Renewable Energy Guide to Certification sets out how developers in these emerging fields can approach certification of their units and prototypes.